We get so many customers looking for Cheap Communion favor ideas. However, just because these personalized measuring tape key chains will not break the bank, it doesn't mean that they won't be appreciated. Quite the opposite, as everyone can use a key chain and a measuring tape. We can offer Communion favors for less money by having you do some of the work. 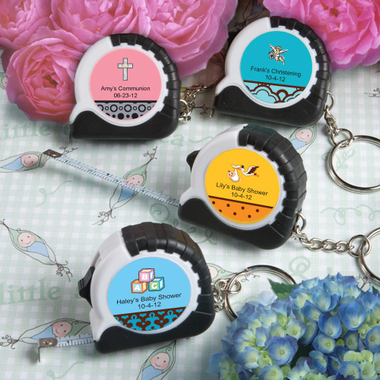 Simply affix the personalized label to the measuring tape and you have a ready-made favor. One of our brilliant customers placed these items in a glass bowl and placed the words, "Measure of Faith" on a sign near the bowl. 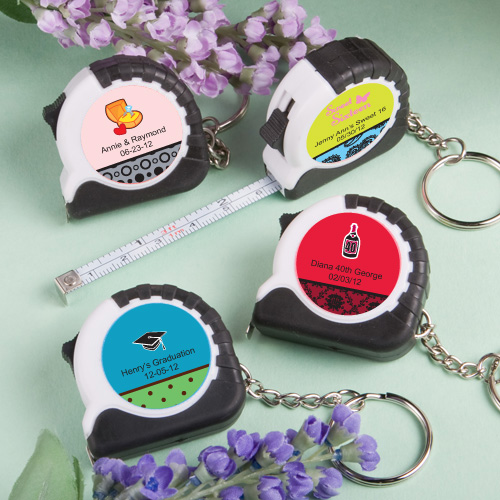 Each key chain/measuring tape favor measures 1 ?? x 1 ?? and has an outer case made of hard white plastic with easy-to-grip black sides and a retractable metal measuring tape inside that expands up to 100 cm or 39 ?? with a black tab to hold your measurement, attached to a silver metal chain and key ring. The case?s outer center is fit for easy application of the personalized label of your choice. Please note that labels do not arrived affixed to the key chains; easy assembly required (they are self sticking labels).